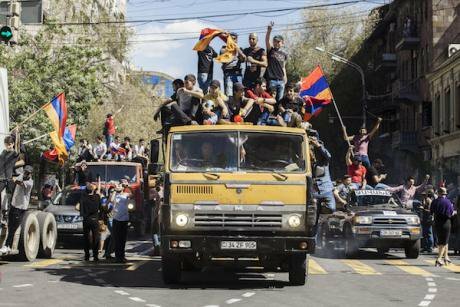 Armenia's emerging revolution isn't about geopolitics or foreign relations, but values. 2 May, central Yerevan. (c) Ani Djaferian/Zuma Press/PA Images. All rights reserved.In 1978. Vaclav Havel wrote The Power of the Powerless, in which he argued against the communist regime, maintaining that it forced people to “live in a lie”. For Havel, the resistance against the lie was to begin living in the truth and to challenge one’s own powerlessness through recognising one’s agency. Fast forward 40 years, and we are now witnessing a new velvet revolution in post-socialist Armenia, a country which proclaimed its independence from Soviet rule in 1991, but which has long struggled to create a democracy. More than anything else, this is a revolution about values. It is about the values of Armenian society and its domestic, socio-economic and political realities. The revolution is not about geopolitics or foreign relations. Since mid-April Armenian citizens, led and inspired by MP Nikol Pashinyan from the Yelk (Way Out) Alliance, have begun to live in the truth as they acknowledge their agency, voice, and power. What began with Pashinyan’s “Take A Step” action, has transformed into a national, some might say even international, movement where Armenian citizens and Armenians living in the diaspora have come together to challenge and reject Serzh Sargsyan (former President from 2008-2018, and former Prime Minister in 2018) and his Republican Party of Armenia (RPA). Taking to the streets and squares in Yerevan, Gyumri, Vanadzor, and smaller towns and villages throughout the country as well as in Los Angeles, Brussels, and London, they have gathered to express their anger and discontent with the morally bankrupt and kleptocratic, oligarchic RPA regime which has ruled the country for two decades. Through these actions Armenia’s citizens, who some had described as apathetic, fatalistic, and demoralised, began to challenge the regime’s hold on power and its legitimacy to govern. Today, per official statistics, over one third of Armenians live in poverty and the country’s population has declined below threef million due to both emigration and a declining birth rate. On the one hand, there is a desire to be rid of the oligarchic system of governance and to implement a more democratic and just system of governance which recognises and respects the rule of law and the human rights of Armenia’s citizens. On the other hand, there is a desire to live in a fairer society, where citizens live with dignity and where nepotism and corruption do not lead to extremes of social and income inequality and poverty. The protesters are rejecting the RPA and its discredited practices and values, which include greed, corruption, nepotism, subservience, violence, and intolerance, and in their place they are advocating new values such as freedom, dignity, tolerance, love, courage, and justice. These lofty ideals have emerged in the revolutionary euphoria which has seized the country, but the revolutionary period is transitory. It remains to be seen how things will develop afterwards, but for now, these ideals and values inform, inspire, and motivate people to take action. As many have already noted, these protests draw from all segments of Armenian society. People from all classes, walks of life, and political and ideological persuasions have united in their rejection of the regime. People hold banners proclaiming the revolution as one of “love and tolerance”, rather than of hate and revenge. People in the streets and squares have begun to treat each other with more kindness, tolerance, and courtesy. More and more women, young people, and disabled people, are involved in these protests. Alongside Pashinyan, Zaruhi Batoyan, a disabled activist and Yelk Alliance member of the Yerevan Council of Elders, has spoken eloquently from the dais rallying people to take action. Batoyan was also instrumental in organising the ‘pots and pans’ action that has now become an almost nightly event as people bang pots and pans together from 23:00-23:15 as a form of protest. The action is meant to allow those, who for whatever reason cannot leave their homes to attend the protests in the square, to express their discontent in this way. Inclusion and tolerance are new values to Armenian society, where not only disabled people, but also people who identify as LGBT have faced discrimination, marginalisation, and even violence. Indeed, the RPA old-guard has used the presence of feminists and LGBT activists involved in the movement to attack Pashinyan as promoting "western values". And to be sure, the old divisions may return after the revolutionary euphoria passes, but for now, suited doctors and lawyers are rallying and marching alongside young tattooed hipsters, grizzly-bearded old men, and vocal young feminists, in an atmosphere characterised by peace, joy, and tolerance. One of the key slogans of this revolution, alongside, “Reject Serzh” and “With courage” (dukhov), is “We are the owners of our country”. Unlike the previous two, the latter slogan has been around for nearly a decade and was adopted by different movements ranging from the youth-led Occupy Mashtots Park movement in 2012 to the Sasna Dzrer group led by armed veterans of the Karabakh conflict which captured and held a police station in Yerevan in 2016. In this context, being the owner of one’s country means that people become active subjects rather than passive and silent bystanders in society. Instead of privately complaining about the status quo, they begin to take public action to change their lives and their society. In the midst of this velvet revolution, people are recognising their power and agency. This can be observed not only through the acts of civil disobedience of strikes and blocking roads, but smaller actions such as people taking to the streets after the demonstrations with brooms and bin bags to clean the streets of the debris from the previous night’s demonstration. This responsibility is not only about one’s own actions, but also a sense of responsibility towards others in society and for the country’s future. “With courage” (dukhov) has become a rallying cry as protesters have rejected the regime’s attempt to rule by intimidation and fear-mongering, as well as the corruption and nepotistic politics which had become endemic in the few years where particular individuals and their clans seized political power and amassed huge fortunes that were hidden away in offshore accounts. They want to live free from fear, intimidation, and in a country where rule of law and justice are respected. Over the past two decades, the oligarchic regime, by seizing both the political and economic sectors, used brute force and economic repression to extend and consolidate its hold on power. Oligarch politicians, such as MP Samvel Aleksanyan (Lfik Samo) and former Prime Minister Hovik (the Mouse) Abrahamyan, are much-reviled figures in Armenian society. As part of the RPA led government, they have operated with impunity, intimidation, and violence, propagating a politics of fear. In support of his RPA colleague, MP and the Chair of the Parliamentary Standing Committee on the Economy, Khosrov Harutyunyan, added: “Poor people don’t have money, hence they don’t buy anything. What difference does it make if meat is expensive or cheap,” adding that “potato eaters don’t eat meat.” This incident illustrates RPA politicians’ disconnect from society and shows their cynicism and lack of responsibility as public servants for improving the livelihoods and wellbeing of those they were elected to serve. Events are rapidly developing and predicting where they will lead is a fool’s errand. While Sargsyan resigned as Prime Minister on 23 April, it has now become clear that he is operating from the shadows and neither he nor his party are ready to let go of the reins of power. Many in Armenia argue that whoever comes to power must have Moscow’s tacit approval. For this reason, Pashinyan, while advocating for regime change, continues to publicly proclaim that he will not shift the country’s foreign policy stance, especially with regards to its relationship to its powerful neighbour to the north. After Parliament failed to elect Pashinyan to the post of Prime Minister on 1 May, it was announced on 2 May that a new vote will take place in Parliament on 8 May. The candidate that receives one-thirds of the vote will become the new Prime Minister. While the RPA has said it will not nominate a candidate, many mistrust the party and fear it will once again implement its traditional tactics of intimidation to shape the electoral outcome in their favour. But can such tactics succeed given that hundreds of thousands of Armenians have now found their voice, their power, and now see themselves as history makers and the owners of their country? Can violence and bloodshed be avoided in a context where passions and emotions are running high? As the revolution continues to be livestreamed, we shall have to wait and see. This article originally appeared on the London School of Economics EUROPP blog. It gives the views of the author, not the position of EUROPP – European Politics and Policy or the London School of Economics.